Marine Corps Base Camp Lejeune (/ləˈʒɜːrn/) is a 246-square-mile (640 km2) United States military training facility in Jacksonville, North Carolina. 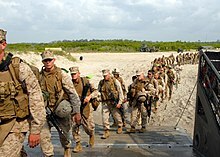 The base's 14 miles (23 km) of beaches make it a major area for amphibious assault training, and its location between two deep-water ports (Wilmington and Morehead City) allows for fast deployments. The main base is supplemented by six satellite facilities: Marine Corps Air Station New River, Camp Geiger, Stone Bay, Courthouse Bay, Camp Johnson, and the latest addition to the facility, the Greater Sandy Run Training Area. In April 1941, construction was approved on an 11,000-acre (45 km2) tract in Onslow County, North Carolina. On May 1 of that year, Lt. Col. William P. T. Hill began construction on Marine Barracks New River. The first base headquarters was in a summer cottage on Montford Point, and then moved to Hadnot Point in 1942. Later that year it was renamed in honor of the 13th Commandant of the Marine Corps, John A. Lejeune. MCB Camp Lejeune can help to prepare warfighters for combat and humanitarian missions abroad. Camp Lejeune takes advantage of 156,000 acres, 11 miles of beach capable of supporting amphibious operations, 32 gun positions, 48 tactical landing zones, three state-of-the-art training facilities for Military Operations in Urban Terrain and 80 live fire ranges to include the Greater Sandy Run Training Area. Military forces from around the world come to Camp Lejeune on a regular basis for bilateral and NATO-sponsored exercises. 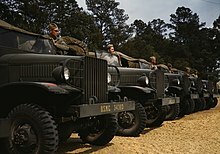 Camp Lejeune was featured in the hit CW network drama One Tree Hill in late 2006. From at least 1957 through 1987, Marines and their families at Lejeune drank and bathed in water contaminated with toxins at concentrations 240 to 3400 times permitted by safety standards, and at least 850 former residents filed claims for nearly $4 billion from the military. The Multi-District Litigation was dismissed on North Carolina statute of repose grounds on December 5, 2016, and the appeal to the 11th Circuit is ongoing. Straw, et. al. v. United States, 16-17573 (11th Cir.). Straw has appealed this case to the U.S. Supreme Court twice, with one currently pending in the Supreme Court docket. Disability activist Andrew U. D. Straw is also pursuing claims based on implied contract and Fifth Amendment Takings theories at the U.S. Court of Federal Claims, stating that the U.S. Marine Corps' UCMJ responsibilities imply a contract to protect U.S. Marine Corps family members. Straw v. United States, 1:17-cv-00560 (U.S. COFC). This case was dismissed and denied on appeal also. Straw has also advocated for legislative reform to avoid the legal arguments of the Department of Justice. The main chemicals involved were trichloroethylene (TCE), a degreaser, perchloroethylene (PCE), a dry cleaning solvent, and benzene; however, more than 70 chemicals have been identified as contaminants at Lejeune. A 1974 base order required safe disposal of solvents and warned that improper handling could cause drinking water contamination. Yet solvents were dumped or buried near base wells for years. The base's wells were shut off in the mid-1980s, but were placed back online in violation of the law. In 1982, Volatile organic compounds (VOCs) were found to be in Camp Lejeune's drinking water supply. VOC contamination of groundwater can cause birth defects and other ill health effects in pregnant and nursing mothers. This information was not made public for nearly two decades when the government attempted to identify those who may have been exposed. An advocacy group called The Few, The Proud, The Forgotten was created to inform possible victims of the contamination at Lejeune. The group's website includes an introduction with some basic information about the contamination at Lejeune, including that many health problems various types of cancer, leukemia, miscarriages and birth defects, have been noted in people who drank the contaminated water. According to the site, numerous base housing areas were affected by the contamination, including Tarawa Terrace, Midway Park, Berkeley Manor, Paradise Point, Hadnot Point, Hospital Point, and Watkins Village. On March 8, 2010, Paul Buckley of Hanover, Massachusetts, received a 100%, service connected disability from the Department of Veterans Affairs for cancer (Multiple Myeloma), which was linked to toxic water exposure on Camp Lejeune. This is believed to be the first time the government has admitted the link between the contamination and illnesses. On 18 July 2012 the US Senate passed a bill, called the Janey Ensminger Act in honor of retired Marine Master Sergeant Jerry Ensminger's daughter Janey who died of cancer at age 9, authorizing medical care to military and family members who had resided at the base between 1957 and 1987 and developed conditions linked to the water contamination. The measure applies to up to 750,000 people. The House approved the bill on 31 July 2012. President Obama signed the bill into law on 6 August 2012. The bill applies to 15 specific ailments believed to be linked to the contamination, including cancer of the esophagus, lung, breast, bladder or kidney; leukemia; multiple myeloma; myleodysplasic syndromes; renal toxicity; hepatic steatosis; female infertility; miscarriage; scleroderma; and/or neurobehavioral effects or non-Hodgkin's lymphoma. The Department of Veterans Affairs is assigned by the bill to provide the medical care. To fund the medical care, the bill extends higher fees for VA home loan guarantees to 1 October 2017. A U.S. Supreme Court ruling in June 2014 potentially curbs groundwater contamination lawsuits by families at Camp Lejeune. Federal law, which imposes a two-year statute of limitations after the harm is discovered, would pre-empt North Carolina's 10-year "statute of repose" law. State law makers are trying to eliminate the state prohibition on lawsuits being filed 10 years after the last pollution occurred or from the time a polluted property was sold. The Base Realignment and Closure Commission (BRAC) recommended in 2005 that the brig be closed and the Secretary of Defense has to implement the commission's recommendations by a date still unknown. A new brig was built at Camp Allen in Norfolk, Virginia with a small detention facility built at Camp Lejeune to hold detainees awaiting court martial. A new Brig was constructed at Camp Lejeune finishing in the early fall of 2012. The old brig was decommissioned and demolished in the late fall of 2012. Murder of Maria Lauterbach, a Lance Corporal stationed at Camp Lejeune who was murdered in December 2007. ^ Pronouncing The 'R' In Camp Lejeune "One of the Marine Corps' biggest bases is Camp Lejeune (luh-JUNE) in Jacksonville, North Carolina. But for years, many people have been mispronouncing the base's name. The family of Lt. Gen. John Lejeune, whom the base was named for, says luh-JERN. Now there's quiet move the military to correct the pronunciation." ^ "Camp Lejeune History". Lejeune. United States. Archived from the original on 2012-10-14. Retrieved 2007-10-01. ^ "E. Texas man seeks congressional help for illness caused by toxic water". KLTV. KLTV. January 27, 2015. Retrieved May 17, 2017. ^ a b c d e Thompson, Estes (2007-07-10). "EPA investigating whether radioactive waste was buried at pollution-plagued Camp Lejeune". ABC News, Associated Press. Retrieved 2007-09-29. ^ Camp Lejeune residents blame rare cancer cluster on the water For three decades, dry-cleaning chemicals and industrial solvents laced the water used by local Marines and their families. Mike Partain and at least 19 others developed male breast cancer. ^ a b Jarvis, Craig (June 14, 2014). "Lawmakers rush bill to protect Lejeune, Asheville residents in pollution cases". Charlotte News & Observer (NC). Retrieved 18 June 2014. Wikimedia Commons has media related to Marine Corps Base Camp Lejeune. "Camp Lejeune MCIEAST Regional Brig." Moseley Architects.